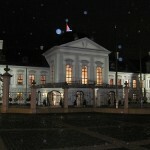 The Grassalkovich Palace is located in the center of Bratislava and it is the residence of the President of Slovakia. The building is built in Rococo/late Baroque style and it has a beautiful French Garden. 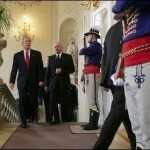 The palace was built in 1760 for Antal Grassalkovich, a Hungarian noble. 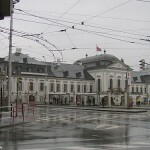 The Habsburg royal court often arranged parties here in the 18th century, and for example Joseph Haydn several times premiered his works in the Grassalkovich Palace. 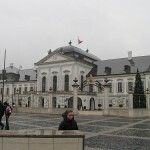 The Palace went through a reconstruction in the early 1990s, and it has been the residence of the Slovak president since 1996. Most of the park behind the Grassalkovich Palace is open to the public.